It doesn’t matter how old you are, everyone has a drooly Pavlovian response when they hear the melodic song of an ice cream truck in the distance. As we finally emerge from June Gloom and temps start to rise, here’s the scoop (heyo!) on where you need to be treating yourself. Hammond’s is a dream come true for the indecisive ice cream fanatic. It serves a large variety of Hawaii’s Tropical Dreams ice cream flavors, but at Hammond’s you don’t have to pick just one or two flavors. You can order a flight of three to six different flavors served in mini cones that come in their own little stand. 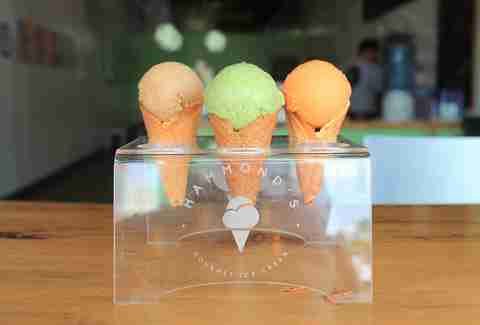 For the last 15 years Mariposa has been making all of its egg-free ice creams and sorbets on-site in Normal Heights. It makes the best Mexican chocolate ice cream on this side of the border. The mom-and-pop shop is also keeping things environmentally friendly by using compostable wooden spoons instead of plastic. If you’re a music fan you have to stop in just to check out all of the rad memorabilia hanging on the walls. From the classic design to the vintage mint-green milkshake mixer, walking into Moosie’s is pretty much like walking into an old-school ice cream parlor; that is if you don’t notice the iPad on the counter. The ice cream comes from the famous Fosselman’s Ice Cream Co. which has been around since 1919. Moosie’s even hand-makes its waffle cones fresh every day. This is another place where you don’t have to stick to just one flavor since they are happy to mix two flavors into a single scoop. If you want something a little different you should give the Moosie’s Sparkler a go. It’s a refreshing ginger ale float with your choice of sorbet. Hardly a day goes by when there is not a line out the door of the original Pacific Beach location and once you’ve had one of the cookie-flanked ice cream sandwiches you’ll understand why. The Baked Bear makes its cookies fresh daily and you also have the choice of smashing your ice cream between brownies, waffles, or donuts. No matter which you choose, make sure you get it served hot-pressed then drizzled with caramel or rolled in a topping like sprinkles or Fruity Pebbles or both. For such a tiny island, it’s pretty great that Coronado has not just one, but two MooTime Creamery locations. One of which can be found inside the Hotel del Coronado, adding even more nostalgia to this already historical hotel. You have dozens of combos to choose from; just pick your ice cream and whatever candies you want to add in and then let them smoosh it all together. If you’re tired of the same ‘ol ice cream cone or cup, order the dessert nachos made from a pile of waffle cone chips topped with three scoops of ice cream or the Moo Tacos. 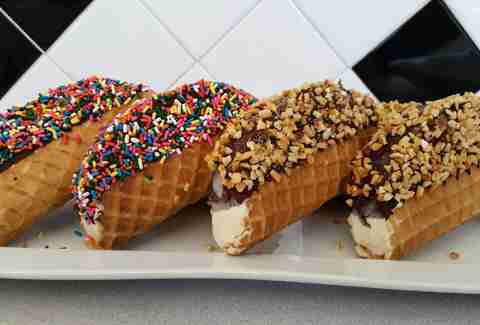 Yes, ice cream tacos. 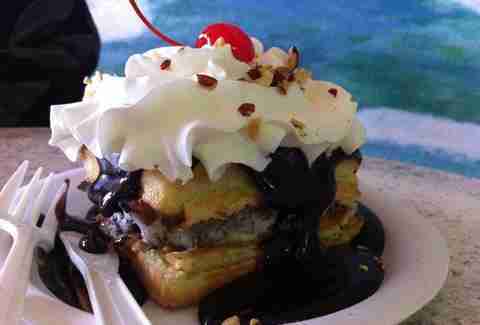 If you’re on your way to take a long walk off a short pier, specifically the one in Imperial Beach, make sure you stop by Cow-A-Bunga for a sweet treat on your way. This great little shop is right at the entrance to the pier and has been making its ice creams locally since 2000. Have a seat on the outdoor patio or take your ice cream on a stroll along the beach. It also serves gigantic shaved-ice sno cones and delicious coffee drinks. You can’t go wrong with any place that caters to man’s best friend and at The Daily Scoop even Fido can get his own scoop of doggy ice cream. 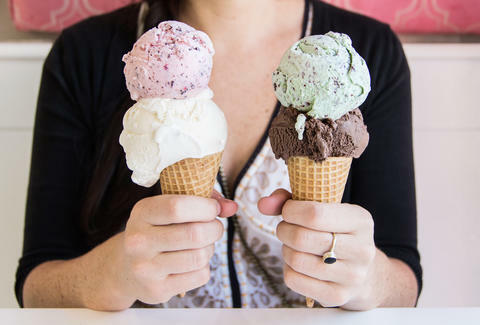 The dish on this place is that it keeps it local by serving Niederfrank’s all-natural ice cream which has been made right here in National City since the 1940s. There is a variety of flavors including a pink spin on mint chocolate chip. Beyond just the ice cream the shop also serves sno cones, baked goods, and some pretty incredible house-made red velvet cupcakes with cream cheese frosting. Lighthouse Ice Cream has been a staple in Ocean Beach for about three decades. 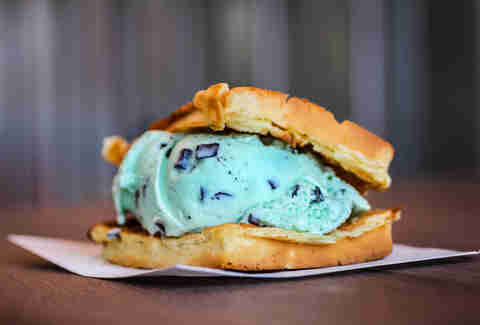 This place is famous for its hot waffle ice cream sandwiches. You can choose from different waffle flavors and if you’re smart you’ll order yours with strips of bacon on it and then have them make it a sundae stacked with all the fixings. If you’ve got a serious sweet tooth order the Big Olaf Special. 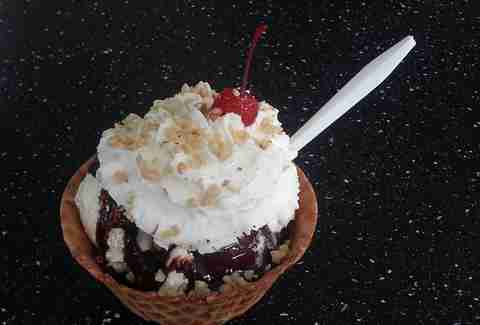 It might kill you, but death by a double-scoop waffle cone sundae with whipped cream, nuts, a cherry, and your choice of topping is not a bad way to go. They also might be single-handedly keeping the photo-printing business up and running with their collages that feature pics of all their loyal customers. Viva Pops started years ago as a little ice cream cart, but is now a one-stop popsicle shop in Normal Heights selling gourmet, organic, all-natural treats. Most of the fruits and herbs used to make its unique flavors are sourced from local suppliers and SD farmers' market vendors. 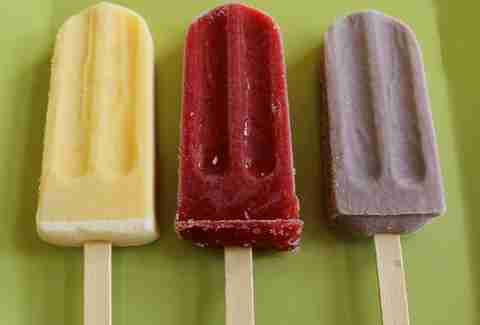 These aren’t the basic, boring popsicles from your childhood either. 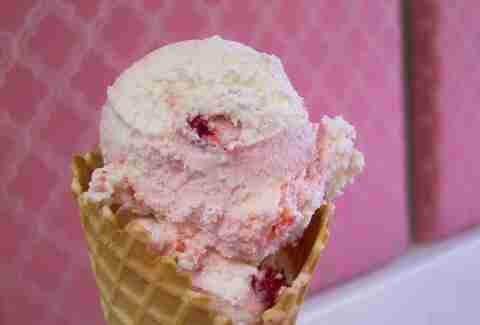 Flavors range from spicy mango chili and lavender lemonade to mojito and goat cheese cherry cheesecake. If you can’t swing by the shop on Adams, you can catch them at one of five farmers' markets around SD.